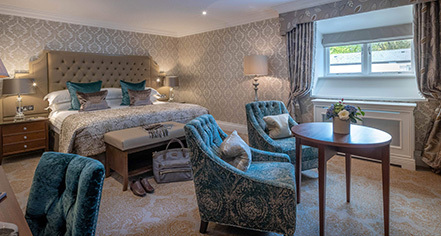 With a reputation built on unparalleled warm hospitality, Dromoland Castle Hotel offers guests a special experience in one of the finest five-star Ireland hotels. Careful attention to detail inspires guests to return to this luxury Ireland castle time and time again. Nestled into the original castle walls, the 1,670 square foot staterooms and suites are located off the main and Shakespeare galleries. Each room is unique in design and dimension with its own intimate seating and dining area. 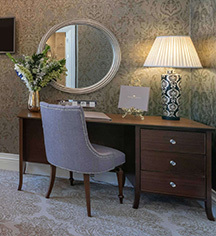 The bespoke furniture featured throughout complements the range of design styles with fabrics especially commissioned by Colefax and Fowler. The lighting stems from a mixture of crystal and nickel lamp bases using rich wood and employing the elegant lines of the Louis XV furniture. The beautifully appointed baths offer complete luxury and feature marble and painted furniture. This charming quadrangle of 28 guestrooms was built in 1736 by Sir Edward O'Brien and is almost a century older than the rest of the five-star hotels in Ireland. The 590 square foot guestrooms feature a cottage-style décor, based on 18th century botanical drawings that complement the sumptuous upholstery designed by the French Fabric House’s Pierre Frey. The deluxe guestrooms are located throughout the castle and overlook the lake and Dromoland gardens. Each of the rooms has been individually designed and decorated with guests’ comfort in mind. The overall design concept is for a contemporary look with a classical feel using a combination of furniture styles ranging from the 19th century empire style to Louis XV, using specially commissioned wall fabric by Canovas.